After receiving the first Suicide Safer Community Award presented by Forward For Life and Common Unity, Trident Reach the Peoples Charity launched its own press release on the 23rd December 2013 (see below). The press release highlights the benfits to its customers of a combined approach to suicide prevention. To read more about the Combined Approach to promoting Suicide Safer Communities please click here. 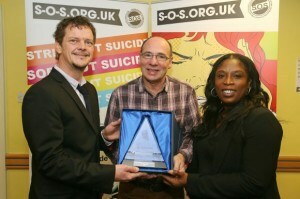 A charity which is working to save lives by tackling suicide rates in Birmingham has scooped the first award of its kind in recognition of its efforts. Trident Reach the People Charity, based in Birmingham, supports vulnerable people across the Midlands, including the homeless and people with mental health problems. Bosses have been presented with the Suicide Safer Community Award, a new accolade presented by the Forward For Life and Common Unity Social Enterprise. They received the award at a presentation at Trident Reach’s Washington Court homeless scheme in Birmingham last week (18th December). The award recognises a number of life-saving initiatives at Trident Reach aimed at reducing suicides among its customers and the wider community. It has been heavily involved in the development of a new Birmingham Suicide Prevention Strategy and action plan to reduce the incidence of suicidal behaviour across the city. Charity staff have been trained in suicide ‘first aid’ by undertaking an ASIST (Applied Suicide Intervention Skills Training) course. The two-day skills-building workshop prepares care professionals and volunteers so they can help people having suicidal thoughts. Staff have also received safeTALK training – a half-day course covering practical steps to help someone who is thinking of taking their own life. Anthony McCool, Charity Lead at Trident Reach, said: “We are proud to receive this inaugural award for such life-saving and life-changing work. “Christmas is traditionally a time of festivities and merrymaking but, for many people, it can be a time of great emotional stress. Some people will get depressed and wonder if they can carry on any more. Birmingham-based Common Unity and Forward For Life are leading the way across the West Midlands and further afield in offering the internationally recognised safeTALK and ASIST courses as a joint approach to establishing ‘Suicide Safer Communities’. They bring with them nearly 40 years of expertise and specialist knowledge in the fields of suicide prevention and mental health.